Everyone in London knows about the new Covent Garden outpost of Hawskmoor. Most of the world’s food bloggers seem to have made it during their soft opening, when the food was at half price – some of them several times. Everyone agrees: it’s amazing. It looks great, the food’s impeccable and the service (relatively easy to get right during the soft opening, to be fair) above reproach. The only downside of going when the food’s half-price is that you end up ordering something twice as expensive as anything you’d ordinarily go for. So it was with me, and the half-kilo chateaubriand that came my way. Unbelievably good – quite possibly the finest protein-consuming experience of my lifetime – but at £60 before the discount also crazily expensive. Steak, composed as it is entirely of expensive meat and not at all of cheap vegetables, represents the worst value in restaurantland. When you can get a three-course set lunch at either of the capital’s three-Michelin-starred restaurants for £45, with amuse-bouches, pre-desserts and wine if you’re lucky, spending that-and-a-half on a main course (and that’s without chips) is the behaviour of a total loon. But standard steaks cost a shade under £30 and are probably amazing enough to be worth a very occasional splurge if you’re in the area, and the kimchi burger on the bar menu is already famous (seems strange to me: I’ve been to Korea, the home of kimchi, and the stuff is utterly revolting). In the corner of the dining room, behind glass but very much on view, are the wines. They’ve got a good list, though you’ll need to spend upwards of £40 if you want a particularly wide selection (there were two choices under £20, eight between £20 and £30, seven between £30 and £40, and then the action starts to hot up). But my problem with the wine list is that it isn’t the spirits list, and the spirits list is amazing. Both lists highlight a few items for special attention. On the wine front, they pick out “our current favourite reds”, and then tell us at length how good everyone thinks they are. There’s an Alban Vineyards syrah which Robert Parker once rated at 100 points, “alongside some of the finest tipples on the planet”. There’s a Sine Qua Non grenache, which is “an extremely rare chance to taste” a wine which “scored as high as 100 points in the Wine Advocate”. There’s offerings from Vega Sicilia – “their wines are some of the finest in the world”; Henri Jayer – “amongst the most sought-after, rarest and most expensive wines in the world” – and Michele Satta – “his wines consistently feature amongst the top wines in the world”. You see the theme. The point of these descriptions seem to be to assure the fat-walleted folk considering trying one of these featured wines that they’re making a great decision, one that Robert Parker would agree with. But it’s hard to warm to their style. It’s selling me the wine, not telling me about it. Then, along with the desert menu, comes the spirits list. In each subsection, one offering is singled out – not necessarily the most expensive, just one they particularly like, or that they’ve got a good story about. A grappa made in a cave in some bloke’s garden, with every label individually painted by said bloke’s fair hand; a tequila which (not totally uniquely, but remarkably all the same) on its third distillation passes vaporously through the carcass of a dead, uncooked chicken, which at the end of the process is removed, shrivelled and probably fairly alcoholic, and buried in the family shrine, and more of the same. Evocative descriptions that double as conversation starters – handily, as tables might be running out of things to say to each other by that stage in proceedings. It is quite possibly the best menu I’ve ever read. And thus I left full and happy, but for the slight disappointment that whoever put together the wine list seems to lack the gift for storytelling that makes his spirit-compiling colleague such an absolute hero. 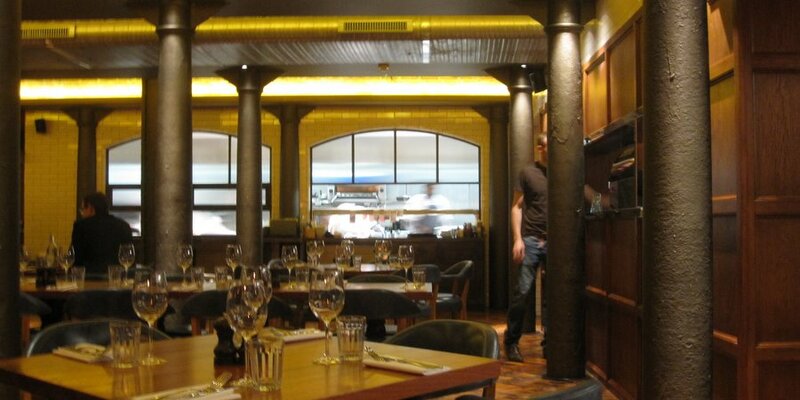 This entry was posted in Uncategorized and tagged Covent Garden, Eating out, Hawksmoor, steaks, wine lists. Bookmark the permalink. Hi, and thanks very much for the review. Also thanks for making me think a bit more about the wine list. I think I agree with you. The wines on the list (in my humble opinion) are excellent, interesting and great value, but the way it’s written doesn’t live up to the way everything else (esp the cocktails is written). I can’t solve that overnight but will get onto it!